Over the course of the year, the strawberry patch soil has compacted. Because of this, it was a good four-five inches lower than when I originally filled it. Because the bed is only a foot deep with plastic landscaping fabric underneath (have to keep the Zoysia grass from growing in! ), this only leaves seven to eight inches of growing area for the roots. Last weekend I was able to get one patch all cleaned up and done. Today – while it was only 52 degrees out, it was sunny and it had to get done. The patches look better now and I found a few big ripe strawberries that were pretty good. During the time the strawberry patches had to be cleaned out, there were also several other strawberry plants that had grown up. The Tri-Star strawberries – like almost all other strawberries – make "runners". They put out these stem-like extensions and a new strawberry plant is created from them. Well, I uncovered and pulled out about 16 plants from the first patch last weekend – and pulled out 26 this weekend! So, I have almost doubled the number of strawberry plants between the two beds. During the summer I pulled out a bunch of them as well and put them on the compost pile. This time I planted them in the large front raised bed. If they survive over the winter, I plant to give them away to my parents and the neighbor if he is interested. I plan to mulch up a lot of leaves since our driveway is fully covered with them – and put them over the top of the strawberries. Hopefully this will keep them 'insulated' enough to survive the winter. Lastly, a picture of the grape vines. They are beginning to die back and ready themsleves for winter as well. They definitely grew to the top of the arbor and even across the top of them in the first year! I am looking forward to having some grapes to use for wine and table eating next year. Unfortunately, only two of the four grapes that were planted survived. While I was out fixing the strawberry beds, I noticed one of the dead vines was completely pulled up out of the ground – it snapped right off at the ground level. So, I lightly pulled on the other dead vine and it also snapped right off as well. Well, I have tabulated and tallied all of the numbers for the amount of weight for each of the items grown this year. To me, this is pretty remakable but after seeing several other individuals have 500 pounds and even over 1000 pounds produced from their gardens, I am quite far from that. But, I am happy with the amount this year. The grand total for the year came in at 260 pounds, 8 5/8 ounces of produce. Now since I'm a numbers kind of guy, the next step will be to compare the cost of them at the local supermarket that we purchase groceries from. Although all of the above were fresh and organic, I will compare them against the prices of the items we typically buy to get a **real** estimate of the amount of money that was saved with the garden this year. If you are interested in helping your power bill by a small amount, then this How To will assist you in setting up your MythTV computer to automatically shutdown between recordings and automatically wake back up using the BIOS real-time clock wakeup technique. It took me a few days to finally get this working for me, but this may work for several other motherboards. This was specifically tested on an ECS GF8200A motherboard. The first step is to ensure you go into your BIOS and change a setting under the “Power Management Setup” entry. In there, another entry which says “Resume on RTC Alarm” whould be DISABLED. Although this seems like backward logic, this is the correct way to setup the entry to allow Ubuntu to write to the ACPI RTC “file”. OK, now that the BIOS setting is done, it is time to boot into Linux. One file needs to be modified just a bit. Open the /etc/default/rcS file with a text editor (vi, gedit, mc – whichever you prefer). Now reboot one more time to ensure that these settings will take affect correctly. After rebooting, it is now time to check the actual ACPI wake-up technique on your PC. It should give you a large group of numbers to indicate the alarm has been set successfully. Now, shudown your computer (not just a restart). Hopefully your computer will turn back on automatically. If your computer turns back on in five minutes, then you’ve confirmed that your BIOS will automatically turn back on – and all of your settings for this feature are correct! echo Someone is still logged in, don\’t shut down! # See also ‘man date’ for date/time-formats. Now, one more last thing to do before getting into the settings of MythTV Backend to make this all possible. Now all of the configuration for the operating system is done. It is time to open up your MythTV Backend to make some changes. Go to your Menu at the top (it will say “System”), choose “Administration”, and then choose “MythTV Backend Setup”. Once it loads, go into the “General” item and then you will have to go through a few screens until you get to the Wakeup/Shutdown settings. – Idle Shutdown Timeout – set this to how many minutes you want your computer to be idle before it shuts down. I have mine set to 10 minutes (600 seconds). This way if all of your applications are closed on the computer (basically those that you outlined in your checklogin.sh script), the computer will shut down. – Max wait for recording – set this to how long the computer will stay on if a recording is scheduled. If you have a recording that will take place in two hours and want your computer to stay on, you will put 120 in this field (since this is in minutes). This ensures that the computer will not shut down and then turn back on x minutes later for a recording. If you only have 30 minutes between a recording, it would be pointless to shutdown the computer for 20 minutes (30 minutes – the Idle Shutdown Timeout setting indicated above). Startup Before Recording – this will set extra time to allow the computer to boot up. If a recording starts at 3:00 pm and your computer takes a minute to boot, you will want to ensure this setting is set to at least 60 seconds (I would do 120 seconds to be safe – in case a disk check or something else runs). Otherwise if you do not set this, the computer will start up right when the recording is supposed to start at 3:00 pm and cut off part of your recording. Command To Set Wakeup Time: sudo -H /home/USER/MythWakeSet “$time” —– This command should point to the script that you created above to setup the ACPI wake-up time. Note to change the USER part with your username for the home folder where you saved the script. Server Halt Command: sudo -H shutdown -P now ———– This is the command that will shutdown your computer. I used the -P setting which means to power off the computer for the full shutdown. Pre Shutdown Check Command: sudo -H /home/USER/checklogin.sh ———- This command should point to the script that you created above that will check to see if there are any specific programs running. If they are, this will ensure the computer does not shutdown. Note to change the USER part with your username for the home folder where you saved the script. That is all! Now close out of Myth-Backend and you should be ready to go! The gardening season is almost fully at an end here. The only produce left to grow is the lettuce. I went around today and just took some various photos of the areas in their sad, brown/black state where all you can see is dirt with nothing growing. A few areas still have plants intact because I've been a bit lazy with taking them out. Here you can see the green beans in the bed on the back driveway. I have left them in since they are nitrogen-fixing. Here is the bed where the potato bin was along with the carrots. The potato bin has been dismantled in the front and all of the soil/compost taken out. I'm hoping for better luck next year because the first attempt at this potato bin was a bust. And here is where the potatoes were grown directly in the ground next to the house. This is where the majority of the potatoes came from. There are a few Tri-Star Strawberry plants that are still growing here. I planted two of them since I had extras at the beginning of the year – and now there must be six or more. And the lonely area next to the house. You can see a new item in this picture – a TV antenna! There used to be a TV antenna in this area before it was blown down by a bad winter storm a few years back. With the help of the neighbor, I grinded down all of the rust from the antenna and put on some aluminum paint to make it look brand new! Now we get all of the local channels in at no cost in good stereo sound – and in HD-quality! And the back garden behind the garage. The cucumbers and tomatoes planted here didn't have a good year – although we did get a decent amount of roma tomatoes. Next year I am going to be required to find a new spot for the tomatoes and cucumbers – just because I've grown tomatoes in this bed now for two years. And now for the front garden. Most everything has been taken out of this area. I have left the pepper plants in to see if the few remaining peppers will grow any larger. Back on the 20th, I pulled the last of the pappers – more on that later. The lettuce is the only thing remaining that will possibly yield some produce. This fall crop of Black Simpson Elite lettuce just didn't take off nearly as well as the spring crop – although we can get some of these harvested at this point. Anyways, on to the peppers. On October 20th, I went out and picked all of the remaining peppers that were fairly decent size on the eight California Wonder pepper plants. None of them have been turning from green to red because the temperatures for the past month have been unseasonably cooler. We had a few 70-degree days, but not many. In addition, the rain just won't let up and we've been drenched with what seems like at least an inch or more of rain a week! Just a few days ago we had over three inches of rain over a two-day period. After picking the peppers, they all weighed in at just over nine pouneds! That sure is a lot of peppers and will add greatly to the overall total weight. Tonight I am going to go through my gardening journal and begin tallying up the total weight of produce harvested from each of the different veggies and post those results next time. To end today's post, I thought I would leave you with a few pictures of the forrest behind our house with the changing of the leaves. Wow, it has been several weeks since my last post. There hasn't been a lot going on in the garden for a few weeks – hence the non-existent posts. Over the weekend, I took down the green fence that protected the garden behind the garage and beside the house from the deer. All of the back garden that contained the tomatoes and cucumbers has been taken down. The side garden has also been fully removed from corn. The front garden had all of the green beans removed several weeks ago as well. The only thing remaining in the front yard is the California Wonder pepper plants and some Black Simpson Elite lettuce. 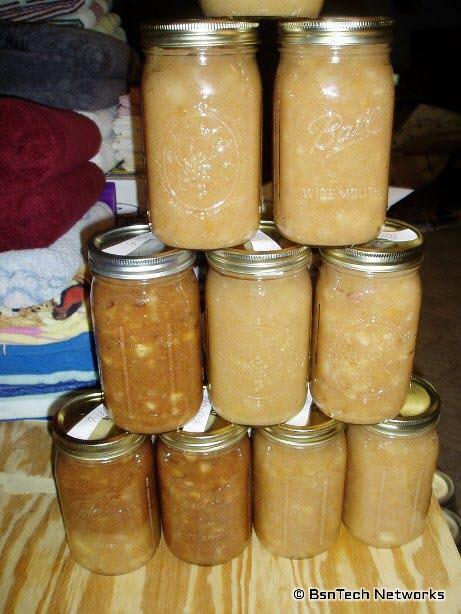 Back on September 17th, we made several jars of applesauce – 19 quarts to be exact. This batch took about nine hours to fully peel, core, smash, and cook the applesauce. A week later, we went back to Wolfe Orchards in Monticello, IL and got another nine pecks of second-hand apples that had blemishes or other irregularities. We still had about 35 canning jars left, and I wanted to fill every last one of them! This time though, we only used an apple corer. This basically cuts out a circular piece in the middle that removes the core and then slices the apple into spears. We then took those spears and put them into the food processor that took care of turning them into applesauce for us! The peels were still attached but they were minced very finely. It does make for a little bit of chewy applesauce, but all of your good nutrients are in the peels of the apple. 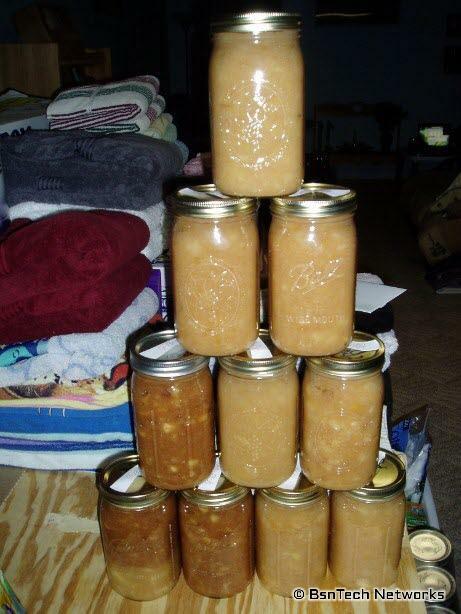 The first night we made 21 cans of applesauce – and it only took us about four hours to do this many! What a big difference from the nine hours it took for the 19 jars last time. A few days later, we then finished the other 14 cans. Overall, it took us less time to make 35 quarts of applesauce using the food processor and apple corer leaving the peels on – than it did the other way making 19 quarts! Now, for the corn. The Sugar Dots corn left much more to be desired this year. I wasn't at all impressed with the size of the corn coming from them after they were mature. However, again I chalk that up to me leaving them in the small seedling planters for three weeks… ouch. Next year I still plan to plant Sugar Dots corn – instead of the Peaches & Cream variety. The Peaches & Cream corn variety did put on two ears on some of the stalks, but left only one good ear. The ears were much better than the Sugar Dots, but there was some major issues with the pollen. Pollen began dropping from the Peaches & Cream variety a full week before more than half of the stalks even had silk emerging! So, overall, we got about 40 ears of corn – although most of them were very stubby and maybe two – three inches long at the most. The best corn did come from the Peaches & Cream variety – but I was not impressed with how many we got. Out of 60 that were planted, only about 25 were usable for anything. The California Wonder peppers keep on producing! I picked another three peppers yesterday and they are very good. However, we will see the demise of these soon because the temperatures have been getting very close to the freezing point over the past few nights. The Black Simpson Elite lettuce is almost a complete bust for this fall crop. Out of about 14 that were planted, we have only had a harvest of about 5 ounces thus far. The leaves are very small. Lastly, let's get to the potatoes! Today I pulled up all of the Kennebec potatoes from the garden beside the house – and also in the potato bin. I am pretty happy with the potatoes that came from the garden beside the house. 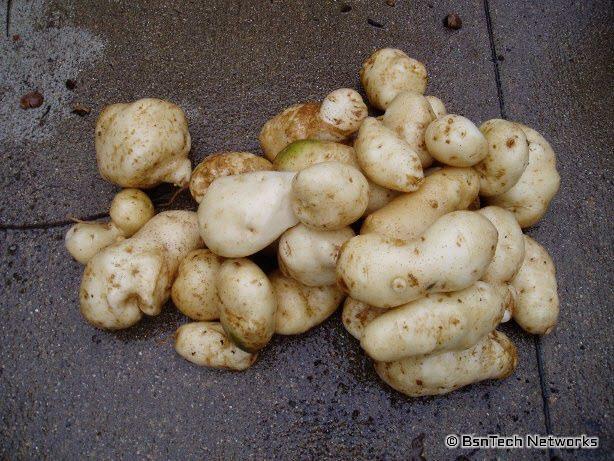 Out of the eight or so potato plants, there was almost 12 pounds of poatatoes that was counted! I found a happy little slug in the ground eating it's way through a pretty big potato – so I couldn't use it because it was mushy and bad. Unfortunately, the potato bin left more to be expected. Right near the top of the stem of the potato plant, there were several Kennebec potatoes that I kept pulling off. I sure was hoping that was a sign of things to come! Welp, that was all the potatoes there would be. It took about 45 minutes to uncover the entire potato bin, and the only potatoes there were was right on the top. The stem was completely gone a few inches down into the soil. This measured in at about 2 pounds, 4 ounces. Most of them are unusable because of the green in them since they were right at the top. 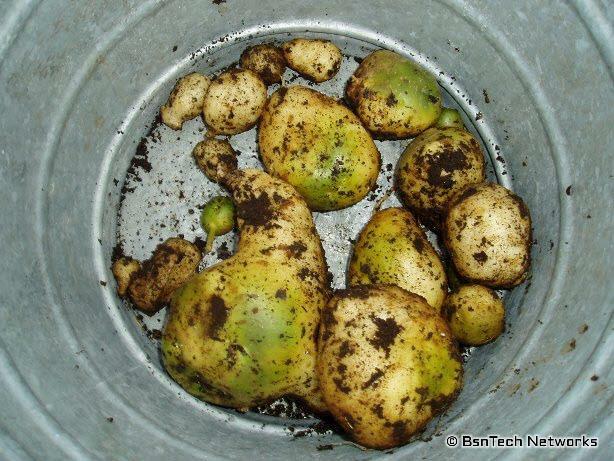 It is a shame because in prevoius pictures, this one potato plant that survived the box really had some huge foliage on it and made it look as though there were going to be tons of potatoes in the box. Next year I do plan to try the potato box again – but this time I will most likely use straw as the plant grows taller instead of filling it in with soil. Maybe this will help to keep the stem from rotting away. In addition, I had my reservations about whether or not Kennebec potatoes would continue to grow in a potato box – because it is said that only late varieties of potatoes will grow and continue making potatoes all the way up the box. Kennebec is a mid-to-late variety potato. I'll have to see next year if I can find some russets for this experiment. But, if next year also turns up a bust, then the potato bin idea will be scrapped and I'll use the space for something else. Well, this ends this year's garden for the most part. We'll continue to get some additional peppers and maybe a little more lettuce – but everything else has been cleaned out and gone. I have several pages of information from the journal I've been keeping so I'll do a year-end tally once the peppers and lettuce are fully gone (frosted to death most likely soon) and post total results for comparison.